. 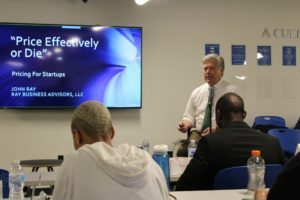 . . Ray shared that “Your ability to diagnose, communicate, and price your value to clients determines everything.” His tips on price and its ability to change the bottom line of a business helped students gain a better understanding of what pricing structures best fit their business models. “Georgia State students,” said Ray, “they’re not just business students,” recognizing the importance of diversity of facilitating those customer conversations to identify diversified and differentiated values. . . Follow this link for the full recap. It was a great pleasure being with this terrific group of student entrepreneurs! When I meet students like Elisabeth-Mia White, I walk away marveling at what a bright future we have to look forward to. Thanks also to Erica Bracey and Sasha-Gay Trusty for the invitation and their hospitality that day, and to Jackie Davis for making this connection.